By comparison to the 2014 Forrester Data Governance Wave, which included many more traditional data management vendors, the 2016 Wave has far fewer entrants. 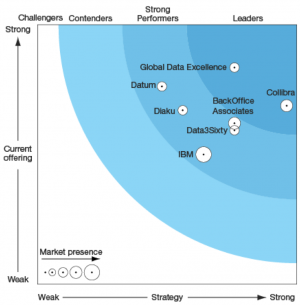 Forrester differentiates between leading vendors, like Collibra, that offer strong support for business lead data stewardship, and more traditional vendors that still expect technical staff to lead the data governance charge. At the recent DAMA Cape Town chapter meeting i was asked to comment on the shift from IT to business driven data governance. Business is increasingly engaging and leading data governance. The promise of big data analytics (the data driven enterprise), compliance and regulatory requirements, and the need to be more efficient in the current, turbulent market are driving the business interest in the more effective use of data. Clearly, IT has a critical role to play, and will be responsible for many of the data management and system changes that must happen in support of governance decisions. Successful governance comes when business leads (and takes responsibility) and IT supports (and is in turn given the necessary support by business). Data governance platforms, like Collibra, are not silver bullets. If the will to implement governance is not there then the tool will have limited impact. However, by automating and managing the complexities of data governance in large organisations they make data governance both visible and practical – critical factors fro data governance adoption. Business buy in and engagement with the chosen platform is another reason that companies choose Collibra. With more than $20million in new funding announced late last year tCollibra hasthe funding to maintain and enhance this leadership position. Congratulations, Collibra! I am looking forward to the journey.